Macheo Program beneficiaries; Mary Wachu, Robert Lubwa, Almercy Momanyi, Caleb Okwani and Joseph Kyule from New Horizons School and John Paul II Secondary School, bagged positions 1 and 3 in a Value Investment Challenge that was held on 15thJuly 2016 at Strathmore University. A team from Starehe Boys Centre won position 2. Macheo Achievement Programme is an initiative of Strathmore’s Community Service Centre, which began in February 2012 to help students from the troubled Kibera slum navigate school life and emerge stronger and well equipped for life. As an after-School-educational support Programme, Macheoorganizes after-school & holiday programs that provide academic tutoring, personal mentoring and character development for high school students. 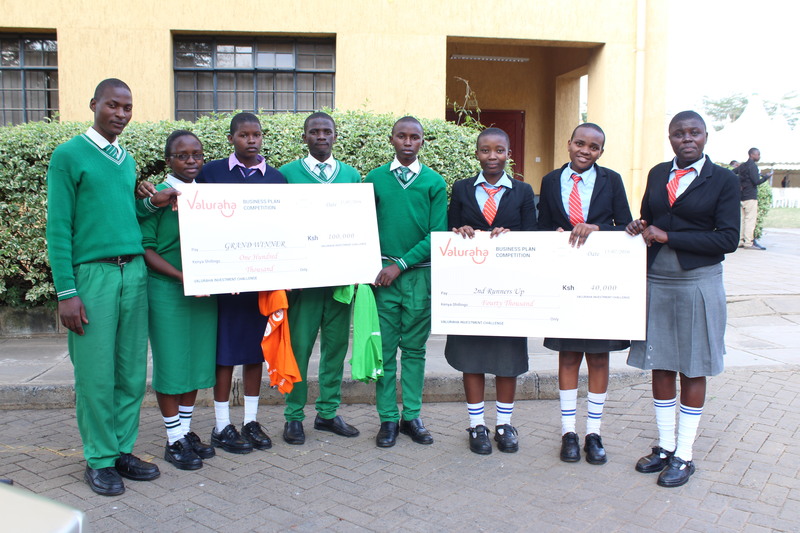 The students are drawn from four secondary schools in Kibera namely; John Paul II, Kibera Glory, Kibera Girls Soccer Academy and New Horizons Secondary School. Strathmore University students are the tutors and mentors to these students. The Value Investment Challenge, organized by Valuraha Group, attracted over 700 students from high schools across the country. 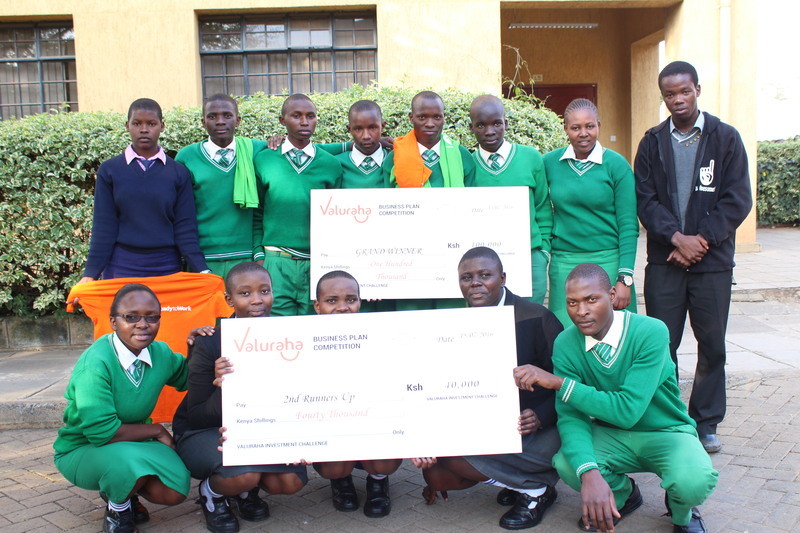 Valuraha Group was founded by Strathmore students, in an effort to provide financial literacy to high school students. Through challenges such as the Value Investment Challenge, and visiting schools to teach students on the journey to financial independence, Valuraha Group aims at becoming the Finance industry for all in Africa. Value Investment Challenge – Business Plan Edition, was the theme at the event that tasked students with creating practical business plans that would work at solving current issues the society faces. This was the first time teams from Macheo participated in such a competition, coming up with business plans and defending them before a panel of high profile judges from companies such as Barclays Kenya, Standard Investment Bank and Centum. Through their prospective company Lafya, the winning team sought to create alternate sources to kerosene lamps, by producing and distributing solar powered lamps, customised light bulbs and mini solar panels. The short term products would provide a safer and affordable lighting solutions to the residents of Kibera. In the long run, the team hopes to install a biogas plant mini-grid, solar park and windmills to sustain the project. The team was awarded Kshs. 100,000 to implement their idea, under the guidance of advisors assigned to them. Position 3 winners also from Macheo, presented a business plan on urban agriculture for rearing rabbits. Through there company Monshama Rabbits Farm, the group comprising of students Sharon Kasandi , Marion Gunyani, and Maureen Adhiambo, noted an increasing uptake in the consumption of rabbit meat in the country with an existing gap in Kibera, as red meat prevails in the area. 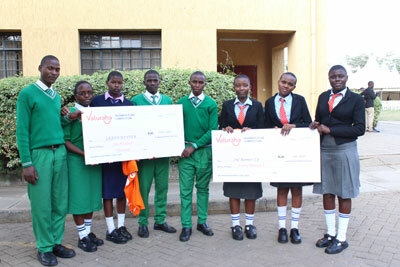 The team was awarded Kshs. 40,000 to roll out their business under the guidance of advisors. Aside from monetary funds, the winning teams were also given t-shirts with Valuraha Group branding. To attain the big wins, the two teams went through rigorous training every Friday and Sunday for the past three months. They were mentored by Strathmore students Junior Omollo and Billy Atela, volunteers in the Macheo Program. Though the teams faced many hurdles during the inception of the training, such as lack of computer labs and internet connectivity in the two schools, they innovatively manoeuvred through these challenges to prepare them for the challenge. The two teams presented the strongest business cases trouncing groups from renowned high schools such as Lenana High, Alliance Girls, Kenya High, St George’s Girls, Precious Blood Riruta, Starehe Boys and Limuru Girls. The judges noted that they demonstrated a greater understanding of their businesses and the industry/market analysis of their ideas. Well done to the winning teams!!! Article by student Junior Omondi Finance student Billy Atela Business Economics student.